Late February and March have been busy months for me as I’ve been keeping up with my honey products and learning/practicing/perfecting my swirls. Some batches have turned out great, others are nice and then there was that batch that nearly seized on me. Hey, it doesn’t matter how it gets into the mould, as long as it comes out as good soap. I’ve been receiving some tremendous help and guidance from a soapbud named Irene. I tell ya, that woman can do swirls that’d make your head spin! She’s really expert at it. 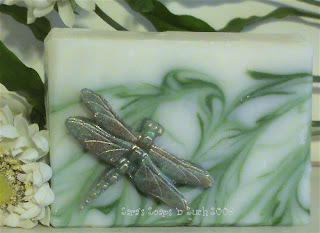 I have managed to pretty closely copy one of her amazing creations, found in this Dragonfly Soap. This soap is scented with a delightful Fresh Cucumber scent. This one has gone fast; I only have three bars left. I made another batch today, but this new batch I scented with Magnolia fragrance. Yuuuummmy!!! Great Spring scents all around! The other creation that went up tonight is Midnight Lilac, a beautiful lightly floral scented soap. Why midnight? Imagine walking through a lush garden with the light from a full moon pouring silver over all the plants and flowers. This soap is midnight dark with gentle lavender and silver swirls. Midnight Lilac is a limited time offer; once these bars are gone, that’s it. So go ahead and get yours. It’s the perfect complement to warming Spring days. 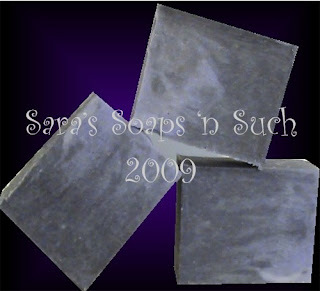 Posted on March 21, 2009 Categories Vintage Sara's Soaps 'n Such2 Comments on Great New Products! Ya know you want to. Yep, that’s right. You want to grab a tube of my newest lip balm, Bee My Honey, a fabulous honey and shea butter all-natural lip balm. Shea butter contains vitamins A & E, both of which are great for the skin, and it also has sun protection properties. Honey lends its sweetness to this nourishing lip balm, and its humectant property also draws moisture from the air to your lips, helping to prevent them from dryness and chapping. Can it get any better? Of course, it can! This lip balm also contains beeswax that came from honeycombs belonging to a beekeeper right here in North Carolina – Goldsboro, specifically. Yes, you read that correctly. Not only is my beeswax an American product, but it’s also a product of my home state. Not even Burt’s Bees uses American, let alone North Carolinian, beeswax (they import it). The honey I use in these lip balms is from a beekeeper in Georgia. Of course, North Carolina has great honey, but I needed something very dark for one of my products. Now that the sun has set and the temps are rapidly dropping even farther below freezing, the beautiful winter wonderland will become a giant sheet of ice. Our schools are delayed by two hours tomorrow, which is what I was expecting. We’ll hit some trouble spots where it’s shady, but I don’t anticipate a whole lot of hassle. I’m just glad that DD won’t have to make up yet another day of school, and she’s glad to be going back. 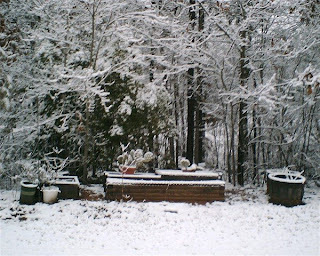 She took some pictures this morning of our lovely snow-draped back yard, but this one is the best. She’s only five but already showing promise of being a great photographer – just as long as she holds the camera steady and keeps her fingers from in front of the lens. After we napped (well, DH couldn’t settle, I dozed and read and DD napped hard), it was time for… SNOW CREAM!!! Snow cream is a mixture of clean snow, egg, milk, sugar and vanilla, and it’s soooooo good. Tradition says that you can’t make snow cream from the first snowfall, regardless of accumulation, but every significant snowfall after that is fair game. While we ate our snow cream, we watched A Goofy Movie. For some reason, an allusion to Easy Cheese in a conversation made me both want to watch that movie and eat Ritz crackers with Easy Cheese. As much as I’ve groused about the winter weather and the make-up days, I’m going to miss the beauty of a snowfall and the sweet coldness of snow cream when we move to the coast. What a great, fun day! 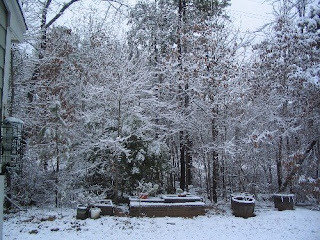 After a few days of grousing and griping about our seemingly never-ending winter, we got hit with our second snowfall in as many months – pretty unusual for NC weather. Well, my choice was to either sit inside where it’s warm and bemoan the snow (though enjoying its prettiness, albeit out the back door) or live in the moment, bundle up and head outside with my husband and daughter. The choice was easy. After all, is there a whole lot that’s more fun than playing out in the snow with a child? We built a miniature snowman, but most of our outdoor fun is in snowball fights. I tell ya, Special Forces personnel practice for months to be able to dodge projectile missiles like my daughter can dodge snowballs! This morning first thing my daughter and I grabbed our digital cameras and took some pictures from the back patio. My first impression was of this lovely winter wonderland. Snow- and ice-draped trees started to glow in the early morning sun that was just struggling to break through the heavy, grey clouds. The second thing I noticed was a sole pink hyacinth, one that had, being as eager for Spring as I’ve been, poked its head up early, beginning to bloom and blossom in response to a brief spell of milder weather. Its white, yellow and lavender sisters are still in sprout stage, having not yet formed buds. I’m hoping this frigid spell with temps bottoming out in the mid-teens won’t do irreparable damage, because I’ve been anticipating their spicy sweet scent coming in the back door as the weather warms enough that we can open windows and doors again. Anyway, this one pink bloom was covered in snow, its pink hue barely discernible beneath its cold, white blanket. For now, though, it’s time for me to slip into warm bumwear, grab lunch and curl up in front of the fireplace to enjoy a good book and the beauty of our urban winter wonderland, now marred by hundreds of muddy footprints and decorated by a 14″ snowman. 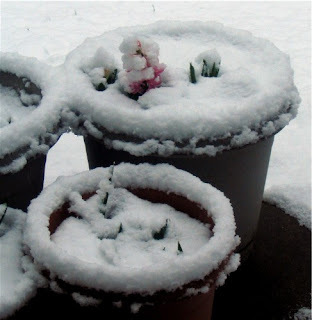 Posted on March 2, 2009 Categories Vintage Sara's Soaps 'n Such1 Comment on Snow Day!